"Leveraging the cloud for enterprise system"
Cloud computing the "Next Big Thing" in IT infrastructure, promises new levels of efficiency, flexibility and cost savings. 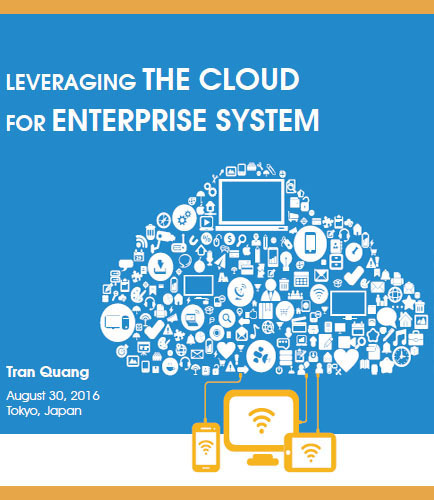 Business enterprises can transform their business models and gain a competitive edge through early adoption of cloud computing technologies. Early adoption of the cloud provides enterprises with an opportunity to transform their business models. Though cost reduction is one of the benefits, enterprises stand to gain from other benefits that come from having a flexible IT infrastructure. Further, through the adoption of cloud, organizations can build virtual and "open" business processes that enable its various stakeholders including customers, business partners and suppliers to connect and do business more seamlessly. In the end, a move to the cloud requires a well-planned strategy considering many business and technical constraints that needs to be mitigated. The cloud is here to stay, so better make most of the benefits that it has to offer. How and why should companies move to cloud? How cloud computing can shift a company investment model from CAPEX (Capital Expenditure) to OPEX (Operating Expense)? Public cloud refers to a cloud computing model where the service providers make available resources such as virtual machines, applications, and storage to the general public users over the internet. Usually, these services may be provided for free or on a pay-per-usage model.